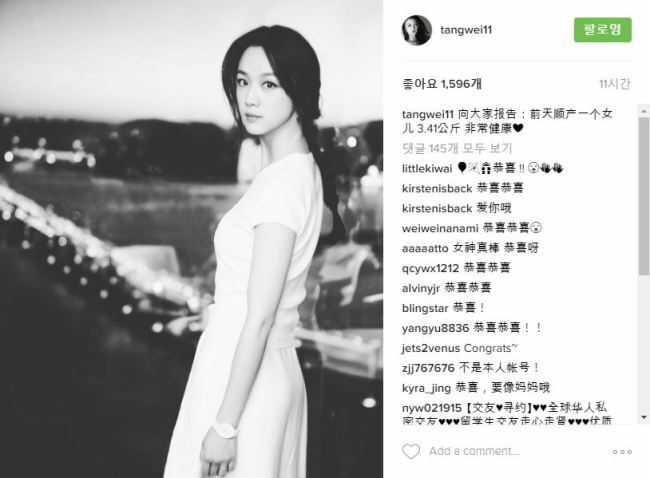 Chinese actress Tang Wei gave birth to a healthy and beautiful baby girl, the actress revealed on her Instagram on Saturday. According to local media reports, Tang gave birth at a hospital in Hong Kong. Tang and Kim married in 2014 on the remote Swedish island of Faro. The two first met while filming “Late Autumn” in 2009 and reportedly began dating in 2013 during Tang‘s visit to Korea for a commercial shoot. Tang rose to fame following her role in the 2007 film “Lust, Caution,” directed by Ang Lee and co-starred with Tony Leung Chiu-Wai, Joan Chen and Leehom Wang.